A unified platform is provided by Druva for backup recovery, automated synchronization, sharing with colleagues & family and protection to end user data. Enterprise users can access and share data instantly with peers via award winning inSync endpoint solution. Druva grant full control to company’s IT division while is securely backed up, preventing data loss. Day by day, volume of corporate data is exponentially growing, and its management has become more complex as well as important like never before. Druva provides an integrated solution for endpoint non-intrusive backup, data loss preventation, file sharing and real time analytics. Druva gives creative ways to collaborate and provide complete visibility to the company. It offers 2 TB of storage space for just 2.50 $ per month. Druva has global presence, located in London, Pune and Sunnyvale. It is private limited company backed up by Nexus Venture Partners and Sequoia Capital. Druva has a valley centric culture producing innovative products with a unque blend utilizing the expertise of industry professionals. Druva has open culture assist them to create customer centric approach and appetite for success drive them to deliver innovative solution. 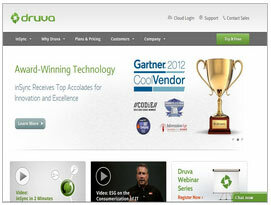 Druva received Codie and best biz award in year 2012. It is also named as cool vendor by gartner. They are also named as Hot company of 2012 by lead 411.